FOR SOME time now there has been an urgent need for a writer—preferably a young one from deep within the ranks of conservative evangelicalism—to attempt an account of just what is happening to Christians under the age of thirty, in the aughts. There is no shortage of young Christian writers hammering away at it on their respective blogs and internet magazines, this one included, and an even greater abundance of prominent evangelical critics chalking up all this introspection to our irrepressible desire to be taken seriously by the secular establishment. But the task of capturing this moment between two hard covers remains unaccomplished—in no small part because the endpoint of the evolution is far from apparent. 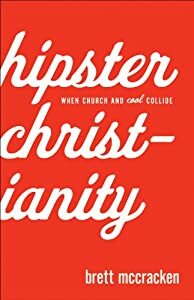 Despite the visions conjured by its title, Hipster Christianity is not the book we have been waiting for. In fact, it is difficult to determine what sort of book it is at all. It is ostensibly a history of the idea of “cool,” a nebulous concept if there ever was one, and its interactions with American Protestantism in the past 50 years. But the murky nature of “cool” quickly becomes apparent when we learn there is, to name only a few: Christian cool, Christian wannabe cool, Christian kitsch, Christian hipsterism, and Christian hipster irony. McCracken bundles up these discordant and often inconsequential moments in evangelical history and delivers a grand narrative. And as we all know, when a book says a little about everything, it stands a good chance of saying nothing about anything. McCracken is at his best as he meticulously documents the philosophical underpinnings of authenticity—a continual cycle of generational, class-driven one-upmanship—and how American culture’s obsession with fad eventually birthed the evangelical “youth ministry” movement. The level of historical detail in his first hundred pages, complete with quotations from Victor Hugo, Hannah Arendt and Adbusters, is informative, and his prose is facile and engaging. The trend-seeking flâneurs of the late 1700s, McCracken explains, begat the the cultural revolutionaries of the 1960s, who were eventually co-opted by the mass culture that would be the backdrop of “cool” Christianity and, later, the reaction against it. Hipster Christianity carries the reader from the youth movement in the church in the 1960s to the arrival of “modern worship” in the 1990s, and shows that an astonishing amount of creative control ended up in the hands of twenty-somethings who would eventually saunter into sanctuaries wearing jeans and lugging their Fenders and drum kits. Tradition, always spooky to evangelicals, was hurled even further from church premises, as the “new wine” of modern worship—rock and roll church, basically—took the country by storm. The church was suddenly more “relevant” than ever, a concept that eventually inspired its own painfully self-conscious magazine and exploded the Christian culture industry. But many young Christians began to feel queasy about the commercialized, marketing-obsessed monstrosities that evangelical churches had become. About the same time, these young Christians began feeling wrenching conflicts with prevailing evangelical doctrines on morality, scripture and society. This is where the story gets interesting, but unfortunately it’s where Hipster Christianity loses the trail. Rather than excavate the often profound disillusionment and doubt that plagued many young Christians who grew up in homogeneous suburban “rock churches” and held real intellectual pursuit at bay until college, McCracken devotes copious detail to hipster fashion. Among the archetypes are “The Academic,” who wears trendy glasses and blazers and listens to Phillip Glass and Vampire Weekend, and “The Mountain Man,” who usually sports a beard, rugged attire, and listens to music with lots of banjo. Christian hipsters, like their secular counterparts, live in places like New York and Seattle. They attend churches that have thrown out the video screens and mash notes to Jesus. At this point, McCracken has described a broad, wildly diverse subculture of young, fashionable Christians and the churches they attend. It’s an undeniable fact that the American Apparel aesthetic, the conversations about what art really means, and vaguely anti-consumerist critique of the mainstream blossomed on the fringes of evangelicalism in the past decade. But by itself, the fact that these twenty-somethings love Sufjan Stevens and like to describe their community outreach as “social justice” is about as revelatory as saying young Christian males spent the 1990s frosting the tips of their hair, bringing their electric guitars to church, mocking the Backstreet Boys and listening to Jars of Clay—all things that were edgy enough in their time. McCracken’s heavily condensed crash-courses on the emergent church, the “new Christian left,” and the Reformed revival, do not go deep enough to explain why his titular demographic is so significant that we need a book to understand it. Is hipster Christianity serious business or isn’t it? Focusing on the trappings of “hipsterism” directs the discussion away from anything that might sound weighty or controversial, and often distills symptoms of young Christians’ search for a theological, cultural and moral identity into a shallow pursuit of street cred. As McCracken walks through the ideas, books, figures and trends that have excited these young evangelicals over the past five years, one cannot help but feel one is reading about characters from a New York Times Sunday Styles piece, a journalistic idée fixe that in another decade will be as forgotten as SonicFlood. Like all good trend manufacturing, it keeps to anecdotes and generalizations. But more importantly, it keeps things fluffy. Focusing on the trappings of “hipsterism” directs the discussion away from anything that might sound weighty or controversial, and often distills symptoms of young Christians’ search for a theological, cultural and moral identity into a shallow pursuit of street cred. These questions about how the Christian life should be conducted inside and outside the church doors, McCracken seems to say, spring from the Christian hipster’s fastidious concern for his personal image and for the “branding” of his faith. It’s a shame that a young writer must repackage this cliché; after all, we already have plenty of well-known evangelical scribes who never tire of explaining that crises among young Christians come about primarily because kids these days just can’t stand to be uncool for Jesus. The trivialities of which Hipster Christianity is enamored are all the more disappointing because of what is actually happening in this demographic—the story McCracken may be reluctant to tell because it doesn’t fit tidily with his concluding advice about being alien to the secular world and “saying no to sin.” Twenty-somethings have indeed rebelled against the more superficial aspects of the evangelical church he identifies—the mindless song lyrics, the excessive casualness, the gratuitous cultural ingratiation, the far-right politics—but the underlying issues are much more profound than he even hints. He is worried about this large-scale flight from the church, as his recent column in the Wall Street Journal suggests, but not nearly worried enough. Young Christians have not jumped ship in record numbers solely because evangelicalism offers nothing that appeals to them socially and aesthetically, but because its intellectual crisis is so dire that it responds to moral dilemmas with little more than fear, nostalgia, and, most disturbingly, hints of bigotry. Deeply uncomfortable with the life of the mind and the modern world, it has asked young believers to take positions that cause them deep distress when these stances conflict with realities they understand from observing the real people all around them. Meanwhile, the church has yet to explain satisfactorily how maintaining its ideological positions benefit them as Christians or their countrymen who are not. The Christian outsiders worth talking about are pained to see the church so blind to the human costs of its activism. They attend uncomfortably or not at all. In significant numbers, they desert to Canterbury, Rome and sometimes finally to that other part of England that gave us Christopher Hitchens. As much as their detractors would like to portray this distress as the very cultural-approval-seeking to which McCracken attributes too many hipster Christian behaviors, there is little glamour in being exiled from both the secular establishment for not denouncing Christian conservatism thoroughly enough and from the evangelical establishment for not swallowing its dogma with sufficient relish. If these people were as shallow as McCracken describes his Christian hipsters, they would have abandoned the faith long ago. Instead, they have looked both backward and forward to find a faith that can handle the moral conflicts of our time. To them, the failure of making Christianity cool was obvious long before McCracken got a publishing contract. But the hope of keeping Christianity on the right side of history is an ever-elusive dream, as is, for now, the hope of finding a book that makes sense of this tumult. Cover/front page images courtsey of LATFH.com. Book cover courtesy of Baker Books.